I spent many years creating chord charts the hard way. I would open up Adobe Illustrator and create amazing works of art, mimicking the style that Hillsong United used. I love this format, especially since it is what I started with back in 2005. Everyone on my worship team liked format as well…all except for the acoustic player. Then I ran a poll on the Worship Leaders + Facebook group and found that 100% of worship leaders are using chord charts like the one at the top of this post. It is not that I want to follow the masses, but I figured there was merit in the fact that almost every worship leader was using this format. 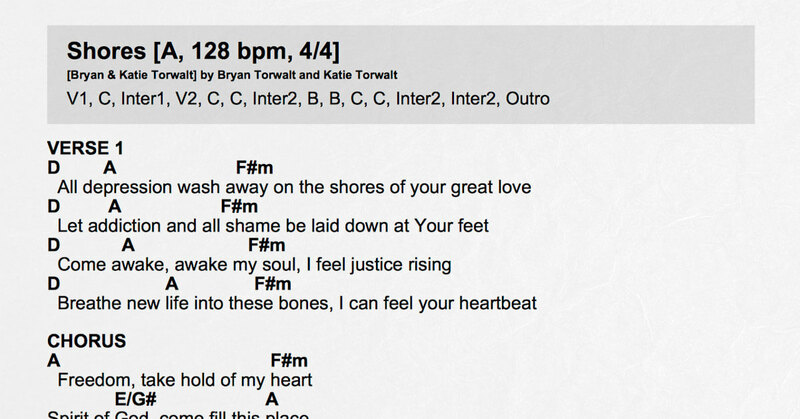 Also, this was the time when I was going to start offering chord charts as part of the song resources on this site, and I wanted provide what most were already familiar with. Then, I discovered Planning Center’s Chord Pro format. Once I discovered Chord Pro, transitioning to the popular format made sense. Now, there is no going back. Not only do chords stay aligned with the words when you change fonts and sizes, but you can transpose the entire chord chart with the click of a button. It will then print looking like the image at the top of this post, with the chords in bold over the lyrics. Be sure to check out our song resources page for free Chord Pro charts. It is just as easy as copy and paste! These short articles are great and insightful. Im called to lead worship and this first hand advise really helps. Thanks for the song resources, but, I’m not seeing chord progression charts. Chose a key and it downloads a PDF, not a chord progression file. Am I missing something? Hey Doug – For the Chord Pro format, click on “ChordPro Chart – Planning Center” and copy and paste into Planning Center. Hope that helps! What did your Hillsong charts look like? You know, it’s been so long ago that I don’t even have a file or image of what the used to look like!